When you want something bad enough, chances are you&apos;ll find a way to get it or make it happen. It&apos;s that way with life, and it&apos;s the same with boats. If you really want a particular boat, I mean really want a particular boat, other things will fall by the wayside and other priorities changed to accommodate getting that boat. Perhaps that is a good way to begin our story about the Great Harbour 37. You see, a few years back, Gary and Sue were world cruising aboard the small 25-foot Erickson sailboat, Moon Boots, twice transatlantic, living among fellow travelers on the French canals, and enjoying a life that only cruisers can understand. They savored the adventure of cruising, and the freedom a small boat offered-even if the layout was narrow and confining. Youth is like that-it&apos;s truly amazing what we can live with at a younger age. They had the champagne life on a beer budget... more of us should learn how to do that! When they returned back to the world, the Danielsons decided to re-enter the routine of careers and working lives, while setting the stage for future adventures-when their hard work could translate into comfortable early retirement. It was also clear that future dreams included a boat-Gary and Sue decided they would one day explore the upper reaches of the Amazon River. As life in the fast lane got going again, they eventually were able to squeeze boat-shopping into their regular weekend activities, along with yard work and local community involvement. They spent a year going back and forth between a motorsailer and a trawler. Both seemed to offer outstanding long distance cruising ability, but unfortunately, both vessel types were considerably more expensive than comparable sailboats. A lot of factors were involved, of course, not the least of which is what do you do with a big passagemaker while you are both tied to schedules, commitments, and life&apos;s other responsibilities? It takes time to pay off a big boat, and weekend adventures (in many places, not just the Great Lakes) are much better suited to play boats that are small and fast. But wait a minute. Why not buy and use the new boat as an office in the interrupted years? After all, if the vessel is legitimately used as a full-time office, it can be depreciated over a 12- year depreciation cycle, the owners getting to write off almost half the cost of the new boat. In addition, the law practice could pay Gary and Sue rent for the space (just like renting office space in a building)-and normal maintenance and utilities would get paid by the practice. Since plans for long distance passagemaking were on hold for several years anyway, why not put the boat to good use in the interim, and take advantage of all the financial benefits? Discussion with their accountant confirmed this as a viable strategy, since it was to be the primary working location for Gary&apos;s law firm. Yet again, another creative solution to the timehonored problem of boat ownership! 1. The boat had to be capable of safe travel up the Amazon River. It would need shallow draft and long, self-sufficient range. If the boat could make it safely up the Amazon they figured, it could handle any other inland waterway with ease. 3. The boat had to readily convert into a fulltime office for Gary&apos;s law practice-a suitable office for at least three people, complete with case files, law books, filing cabinets, fax and telephone lines, computers, desks, chairs, and all the trappings of a modern office. A tall order indeed, especially when you consider the year-round weather conditions of the Great Lakes. Finding a proper passagemaker and office was quite a challenge. Gary and Sue went ahead and determined the interior space requirements for Gary&apos;s office, which they then had to fit into a boat small enough for two people to handle in all conditions. The Danielsons looked around at various production options. They considered a Marine Trader 50 (but felt it wouldn&apos;t be up to the rigors of the Amazon), a DeFever 49 (not an easy conversion into an office), a Nordhavn 46 (also a difficult office conversion), and a Krogen 42 (it just didn&apos;t work for them). They also found that suitable motorsailers needed to be at least 60&apos; overall, and there was no way they wanted a boat that big. During the search, Gary became intrigued by Jay Benford&apos;s Island Packet 35, a vessel that seemed a smaller version of the Florida Bay Coaster (a line of steel freighter-like coastal cruising boats that were built some years back). Gary and Sue talked with Benford about their requirements for a new boat-one with character, one with space, but in an overall size that would fit their small-is-better philosophy. There was even some talk that this new boat might be a candidate for a production series, although the design was far from complete, the engineering had to be done-and there was no one yet identified to build the boat. Several versions of the concept design were drawn, and the Danielsons stayed keen on the project, despite the growing commitment of involvement that is the nature of a custom boat. They investigated building in steel or fiberglass for the hull, but chose fiberglass for its longevity and low maintenance. 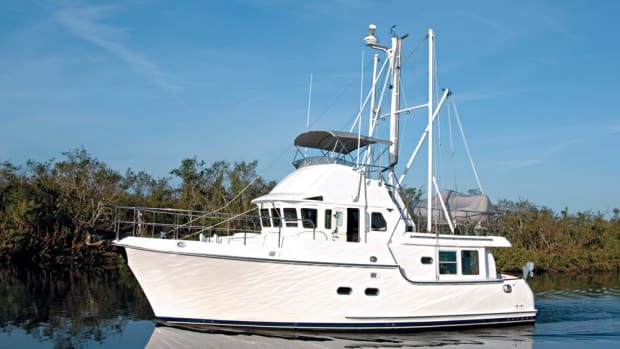 This decision led to the selection of a boat builder-Ken Fickett and his Mirage Manufacturing of Gainesville, FL, an extremely experienced shop with expertise in high quality fiberglass boats, aircraft, and fiberglass components. Ken was excited by the boat&apos;s design, which appealed to his own plans for future family cruising. As often happens in the custom boat business, the project stretched on for months, and some of the players changed. Naval Architect Lou Codega of Arlington, VA, came onboard to do the engineering work on what ultimately evolved into the Great Harbour 37, and Reuben Trane joined the team to market the completed boat, as well as manage the construction of the first hull. Reuben had been instrumental in the Florida Bay Coaster project, and, as a result, had a lot of experience in developing interior layouts that took advantage of the boat&apos;s unique volume. With the team now in place, the project really started to come together, and building the first Great Harbour 37 began in earnest. Take a look at the drawings and photos of the GH37, and I&apos;m sure you&apos;ll agree it looks spunky, almost a caricature of a mini-ship. That image may be true from one perspective, but beyond that profile is one heck of a serious coastal voyager. "It is NOT a toy boat," Lou Codega told me. "The boat was never intended to be cute. All of the features we used were brought to the boat because they work, features commonly found on workboats. "The hull reflects a strong workboat heritage, with fine waterlines forward, deep sections amidships, and a flat run aft. I think this is appropriate, as a workboat must earn its keep 365 days a year and care for its crew, regardless of weather. She is easily driven and comfortable in a sea. Scantlings are to commercial standards. "The machinery and systems are all intended to be simple, accessible, easily maintained, and redundant." Want some examples of the workboat strength of this boat? A strong, unitized structure that doesn&apos;t flex and twist in a seaway, with acres of hand-bonded fiberglass...below the rubrail the solid glass hull is laid up with 12 layers of fiberglass (the outer layers glassed with vinylester resin), and there are numerous bottom longitudinals of foam core. This translates into a hull that is minimally one inch thick; in many sections, over two inches thick. Above the rubrail, the hull is cored with high-tech Nida-Core™, a structural polypropylene honeycomb coring material impervious to rot, water absorption or migration. There are 4 layers of non-woven biaxial fiberglass 2408 cloth on each side of the Nida- Core™ to create a balanced laminate. The superstructure of the pilothouse has 2 layers of biaxial cloth over each side of the core. (All vertical surfaces use 3/4" Nida-Core™, and all horizontal areas are constructed with 1-1/8" Nida-Core™.) This decreasing laminate schedule, and the resulting upper-structure weight, contribute to the overall stability of the vessel, while all areas of the boat are more than tough enough to handle the demands of full-time cruising. All cored surfaces are also vacuumed-bagged for maximum bonding of all materials. This is advanced glass work indeed, but then again, Mirage also builds airplanes and large highspeed sportfishing boats. Needless to say, Fickett&apos;s team builds a strong boat, with stability and strength where needed. How stable is it? Despite the overall high profile of the GH37, Codega&apos;s stability calculations indicate a positive righting arm (or stability range) to 110 degrees-should the boat be knocked down, however unlikely, or be otherwise rolled over on its side, it will right itself immediately. The full shape of the GH37 also creates a tremendously stable boat due to its volume of reserve buoyancy. Permanent fiberglass fuel, water, and holding tanks are built integral with the hull, adding additional structural stiffness to the boat. Are you getting the picture here? A lot of thinking went into this trawler, and it shows! Someday, Ken Fickett, Lou Codega, and Reuben Trane all want their own Great Harbour for family cruising, so each took a special interest in constructing the Great Harbour. Hull No. 1 took a long time to complete, as future production plans first required building reusable molds for the hull and deck-but everyone is happy with the results. Hemisphere Dancer currently sits in her slip in Lake St. Clair, the office of a successful law practice. With carpeting over the varnished sole- and file cabinets, office furniture, files, and shoreside phone and fax lines-she isn&apos;t the picture of a well-equipped cruising boat itching to slip her mooring lines. Alas, such journeys will have to wait for a few years. We got to travel some distance on Lake Huron in Hemisphere Dancer, and see the GH37 while she was still in cruising mode. Let&apos;s go aboard for a tour. Hemisphere Dancer really stands out among the mostly-production boats in the slips along St. Clair Shores&apos; Marine Mile. She looks much larger than her 37 feet. The enormous upper structure of the boat holds your attention, and as you walk around her, you sense she is the caricature of a small ship. Again that&apos;s the image, intended or not. You go aboard the GH37 via port and starboard entry gates on the sides of the aft deck. A thick rubber rubrail surrounds the boat, so you have a readily-available step should you be boarding from a dinghy or extremely low dock. The two entry openings use lift-out panels that, in later boats, will be hinged doors. The 6-1/2&apos; by 14&apos; aft deck is protected by the overhead boat deck, with 6&apos;6"/6&apos;8" headroom. Along the secure 36"-high curved transom is a built-in settee, with storage bins under the cushions for lines and fenders. Gary told me the settee structure adds rigidity to the stern, a feature he wanted in case he needed to use a sea drogue in rough sea conditions. There are pad eyes for rigging such a drogue just below the rubrail under the entry doors. Stepping inside Hemisphere Dancer&apos;s saloon explains why she looks a bit ungainly on her exterior. The interior is open and HUGE! The full-beam saloon is 8-1/2 feet long and just begs for you to set a spell and stretch out. There&apos;s an L-shaped settee on the port side of the saloon, with end tables on each side, and two freestanding chairs opposite. Gary and Sue&apos;s decor theme is understated elegance, hinting of a touch of New England and/or Florida&apos;s Gulf Coast. Mahogany trim accents the interior&apos;s ivory tongue and groove paneling (actually made of fiberglass, it looks smart and is low maintenance), and bright windows bring lots of light to the interior. Both doors from the aft deck have opening windows with screens, and there are two large opening windows on each side of the saloon (also with screens). There is yet another window on the aft bulkhead. Overall, she has a very light, comfortable and airy interior-especially on a 37-foot boat. Stepping down a couple of steps from the saloon level brings you into the galley area. On the starboard side of the boat, the galley is a wide U-shaped affair, with a nine-foot long counter running along the hull. There is a 10" opening port over the double sink, and a 16" by 16" opening hatch directly overhead. Again, with the use of mahogany trim and ivory panelling, the galley is light and contemporary. The boat&apos;s electrical panel is mounted across from the galley on a bulkhead separating the galley from the head compartment. The guest stateroom is also across from the galley, just forward of the saloon on the port side of the boat. It&apos;s more of a temporary living space for visitors, not intended for full-time liveaboard accommodation. There is a fixed desk outboard along the hull, a 6&apos;8" by 30" bunk, and a swingdown berth that stores against the bulkhead. An opening overhead hatch and opening porthole add light and ventilation in the cabin. The boat&apos;s single head compartment is just forward of the guest cabin, and is about the same as you&apos;d find in a condominium or cottage on terra firma-in fact, it doesn&apos;t seem like a marine head at all. A 30" by 40" shower stall is outboard, with a 10-inch opening port. A fullsize Vacuflush toilet handles the needs of the crew, and its placement doesn&apos;t require contorted gymnastics for normal use. A second head is available in alternate layouts. Continuing forward brings you through a sliding pocket door into the master stateroom. This cabin is 8 feet long and follows the full shape of the hull from the chain locker aft-the cabin at the pocket door is over 14&apos; wide. The master cabin has two opening ports (10- inches, with screens) on each side of the hull, and two overhead Lewmar hatches (13" by 18"). With any kind of breeze, this will be a wonderful place to sleep late on a non-travel day. The cabinets outboard of the island berth open to take all the clothes and items you might care to have aboard, as they all have wide and deep shelves-a pleasant change from the tiny teak lockers I often see on other boats. Up five steps from the saloon is the pilothouse. Clearly intended to be a central location on the Great Harbour, it is almost 11 feet long. The forward pilothouse windows have the reverse rake angle found on tugs and workboats, and all three windows come with windshield wipers and washers. Overall visibility is excellent (with a total of 13 windows and ports). The helm console is centerline, with wide open counters on both sides of the helm. There is plenty of vertical and horizontal space for electronics. Hemisphere Dancer has the following equipment to operate and navigate: Wesmar bow thruster, Micrologic ML-250 GPS, Apelco 360 sounder, Raytheon R10 radar, Hummingbird VHF, Navico autopilot, and switches for the Maxwell windlass and the boat&apos;s searchlight. One terrific piece of gear used was the Australian-made Anchor Chain Monitor imported by Wayfarer Marine up in Camden, Maine. Hemisphere Dancer has two units, each dedicated to a separate all-chain rode. What a pleasure to use a monitor to know exactly how much chain is put out or taken in. Truly a useful product, and you don&apos;t have to count painted links! Very nice, especially at night. Behind the helm chair is a wide settee for off-watch crew members. On future boats, this settee will slide out to become a real-life queen bed. Reuben Trane told us, "In my opinion, the pilothouse will be the best place to sleep on this boat." Stepping outside through one of the pilothouse doors brings you out to the 28-inch wide side decks. Since the upper edges of the pilothouse roof extend at least 15 inches beyond the sides of the pilothouse, significantly reducing glare inside the pilothouse. There is also some measure of protection for those moving around outside the pilothouse. From the side decks, the crew can safely move forward behind a full-beam Portuguese bridge to reach the foredeck, accessed via a hinged door in the center of the 40"-high bridge. Located 8-1/2 feet back from the bow, this centerline door locks securely when closed. Moving around on deck, you&apos;ll find 30-inch stanchions mounted atop 10"/12" bulwarks on the foredeck as well as around the sides of the boat deck, so there is always something to grab while walking around. The GH37&apos;s bow is just over 8 feet off the water, and a sturdy raised bow platform keeps anchors and rodes away from the hull. Moving around the GH37&apos;s deck, you are always eight or so feet above the water. It feels secure, but it takes getting used to, being on a 37-foot boat that feels more like a small ship! The boat deck is reached by stepping up a couple of steps from the side decks. In addition to storing the dinghy, we found huge storage lockers built into the aft end of the pilothouse. Two propane tanks store in one locker, yet the three lockers also swallow the dinghy&apos;s outboard supplies, fenders, lines, and cushions. The locker space on the Great Harbour boat deck reminds me more of a garden shed than a couple of lockers on a 37-foot trawler! Lift a dampened hatch in the center of the saloon sole, and you step down into the engine room. Hemisphere Dancer&apos;s Kohler genset sits in its soundshield case on the aft center of the engine room, and the boat&apos;s twin engines are situated far apart on the wide, flat section of the hull. Hemisphere Dancer uses twin Yanmar 3JH2BE diesels for main propulsion. Each engine is rated at 34.9hp@3400rpm (continuous duty), enough to push the 45,000 lb. trawler at 7/8 knots. A single diesel engine is also available. With regard to efficiency, it is interesting to note that the full displacement vessel uses just 1.5 gallons of fuel per hour at 7 knots. That&apos;s it. You want range...600 gallons of diesel give you range! Driving through 2.83 reduction gears, the engines turn 21" by 12" propellers, mounted in their own beefy skegs with attached rudders (each rudder measures 28" by 18- 1/2"). The GH37 can sit squarely on her own bottom for off-season storage, or to dry out in remote locations, as in the Amazon. The skegs were designed for this use, aided by her draft of just 2&apos;10". As you can see from the engine room photo, engine access is a snap-a result of two small diesel engines installed in a large space. All machinery and supporting systems are located in this engine space, excluding the marine head plumbing. The boat&apos;s five underwater thru hulls were also mounted here for ready access in the secure space. Batteries, dripless shaft seals, filters, and fuel management plumbing are all within reach, just a step down from the saloon. Despite the frequent stares from other boaters, it was wonderful trawlering on the Great Lakes-boating in clean, fresh water was a super experience for someone used to salt water. The early morning dampness on deck didn&apos;t have that slimy feel I&apos;m so used to- almost as if someone has just washed down the boat. I could get accustomed to that! Under way, the GH37 really felt much bigger than 37 feet. We didn&apos;t roll much while I was aboard, but Gary is planning to install fin stabilizers because he already knows the GH37 can roll in certain conditions...not excessively, but why deal with it at all? I took some soundmeter measurements while we ran at cruising speed in Lake Huron. At 7 knots (both engines running at 2600 rpm), I measured 69 dB in the pilothouse, 76 dB in the saloon, 79 dB on the aft deck, 71 dB in the galley, 64 dB in the master stateroom with the pocket door closed, and 105 dB in the engine room. On other matters, the boat rides well at anchor, although two things conspire against it. The exceedingly high profile keeps the boat sailing around its anchor (easily solved by using a bridle), and the slightly raised stern section tends to catch the little ripples of waves that run through an anchorage. The sound reminded me of a faucet left on, not particularly loud, just a steady noise. Were it not for this sound, the boat would be entirely silent at anchor, even with a 25-knot wind, gusting to 35. The heavy, unitized workboat construction deadens whistling winds or normal noise from bulkheads and decks working against each other. This boat is solid. The GH37 will appeal to those who want to live aboard and cruise in a smaller vessel, people who prefer a rugged workboat look to a traditional yacht profile and finish. Whether you intend to explore the far reaches of the Amazon, or just enjoy the serene beauty of the Tenn Tom, this boat would be a good choice. It&apos;s a coastal boat, to be sure, but it has more than enough seaworthiness to handle wintering in the Bahamas, or doing the Inside Passage to Alaska, or running down to Mexico. The base price of the GH37 is around $250,000. If you want a custom interior or an alternate layout, there are many available options. The Florida Bay Coaster was a strong presence in every harbor it entered. The GH37 seems to have the same head-turning effect, but the smaller size of the boat seems to intrigue people rather than intimidate them. Buy a GH37, and you&apos;ll be showing it off a great deal, &apos;cause people will come knockin&apos;. The Great Harbour 37 is a genuine, full displacement coastal passagemaker, with long range, safe, onboard comfort, with the interior of a Nantucket cottage. As Codega said, she isn&apos;t a toy trawler. We wish Hemisphere Dancer good luck in her new life as a full-time office. We also hope the sentence is a short one, and that her owners can soon break away from the world, and go off again in search of new adventures. Whatever happens in the coming years, I have no doubt this trawler will be an adventuress whenever and wherever she goes. And her soon-to-be sisterships will no doubt thrill their new owners with economy, big-boat comfort and style, in a mid-sized trawler that is truly workboat tough.